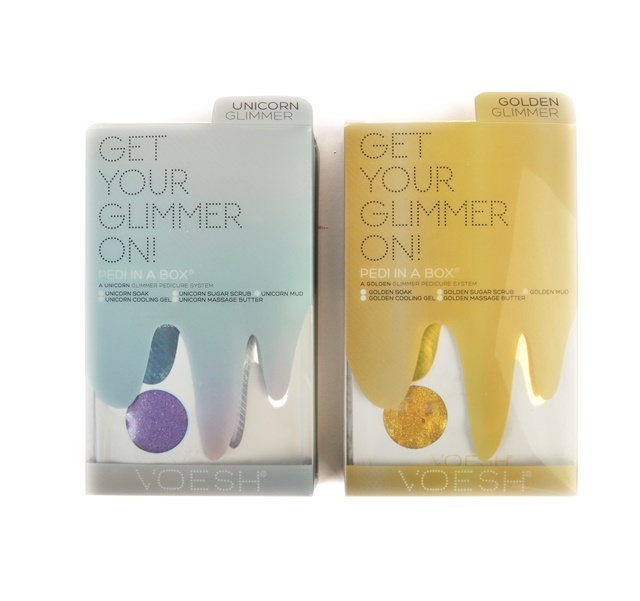 Voesh Pedi in a Box Glimmer is a foot treatment that produces party-ready skin. Golden Glimmer looks like liquid gold and has the soothing and calming benefits of vanilla bean for a sun-kissed look. Unicorn Glimmer is sure to be popular, with the hydrating and softening benefits of peach and an iridescent glow. Each box includes a sea salt soak, sugar scrub, mud mask, cooling gel mask, and massage cream. For more information, visit www.voesh.com.